Today will be the second flash sale of the Mi LED Smart TV 4A and it will be available in a 43-inch and 32-inch models. The 55-inch Mi LED TV 4 is also up for sale today, along with the Redmi Note 5 and the Note 5 Pro smartphones. 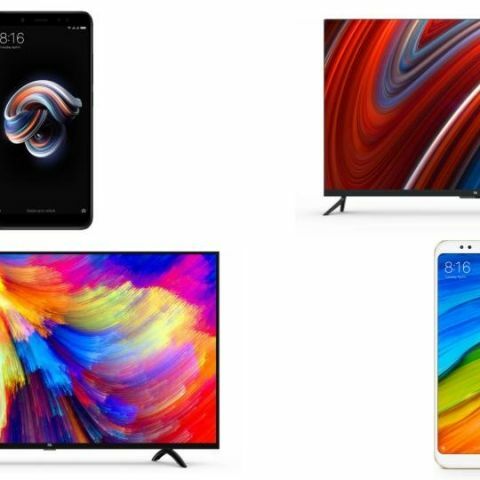 A slew of Xiaomi products are going up for sale today at 12 PM via Flipkart like the Mi LED Smart TV 4, Redmi Note 5 Pro, Redmi Note 5 and the recently launched Mi LED Smart TV 4A. All these devices will also be available via Mi.com and Mi Homes as well, and there is also some launch offers with the devices. Starting with the Redmi Note 5, the 3GB RAM/32GB ROM variant of the smartphone is priced at Rs 9,999 and its 4GB RAM/64GB ROM model costs Rs 11,999. The Redmi Note 5 Pro starts at Rs 13,999 for the 4GB RAM/32GB ROM variant and costs Rs 16,999 for the 6GB RAM/64GB model. The Mi LED Smart TV 4A comes in a 32-inch and 43-inch models, which are priced at Rs 13,999 and Rs 22,999 respectively. Also, the 55-inch Mi LED Smart TV 4 will be available priced at Rs 39,999. For offers, Xiaomi has partnered with Jio to offer a Rs 2,200 instant cashback to the telcos prime subscribers with the Redmi Note 5, Note 5 Pro and the Mi LED Smart TV 4A. In case of the smartphones, the customer needs to perform an activation recharge on the device with Rs 198 or Rs 299 plan and the TV buyers need to purchase a new JioFi device, priced at Rs 999, and perform a recharge of Rs 198 or Rs 299. In both the cases, the cashback will be credited to a user’s MyJio account in the form of 40 vouchers, each worth Rs 50. The Mi IR Cable worth Rs 299 is free with both the Mi Smart TV 4A and the Smart TV 4. Both the Redmi Note 5 smartphones feature a thin-bezel design with an 18:9 display aspect ratio and sport a 5.99-inch full HD+ screen with a 2160x1080p resolution. The Redmi Note 5 is powered by the Snapdragon 625 SoC and comes with a single 12MP rear camera with f/2.2 aperture lens and an LED flash. The front camera is features a 5MP sensor with an LED flash and is capable of recording full HD videos. The Redmi Note 5 Pro is powered by the Qualcomm Snapdragon 636 platform and on the rear, it’s equipped with a dual 12MP + 5MP sensors. While on the front, you get a 20MP camera with Selfie-light on the front. Both the smartphones are powered by a 4000mAh battery, come with a rear-mounted fingerprint scanner and run on MIUI 9 based on Android 7.0 Nougat. Starting off with the Mi LED Smart TV 4, it features a slim, thin-bezel design and runs on Patchwall OS. It is powered by a 64 bit Amlogic processor with Mali T830 GPU and the OS it runs on is a fork of Android (but no Google Play store available). It features a 55-inch 4K HDR display with a 10-bit panel and 60Hz refresh rate. For audio, it is equipped with 16W speakers and claims of delivering Dolby + DTS Cinema quality sound. In terms of connectivity, the Smart TV comes with Wi-Fi, Bluetooth 4.0, 3-HDMI ports (1 ARC), 1-USB 3.0 port and 1-USB 2.0 port. You can check out our review of the Mi LED Smart TV 4 here. Coming to the Mi LED Smart TV 4A, it is powered by a 64-bit quad-core Amlogic processor with 1GB RAM and with 8GB ROM. The device is equipped with two 10 Watts stereo speakers and supports DTS sound. It comes in the two earlier mentioned 43-inch and 32-inch variants and the former model is capable of streaming full HD videos, whereas the 32-inch option can handle HD ready (720p) video playback. For connectivity, both variants of the Smart TV 4A feature Wi-Fi, Ethernet, an earphone out, and an AV port. The 43-inch model sports 3 USB, 3 HDMI and an S/PDIF port, whereas the 32-inch model comes with 2 USB ports and 3 HDMI ports. The TVs run on Patchwall OS. Read our spec comparison of the Xiaomi Mi LED Smart TV 4A 43-inch vs competition here.